Internationally exhibited and award winning artist Shannon Amidon presents her collection of 50 pieces of artwork created in 50 days for the Sanchez Art Center 50|50 exhibit. 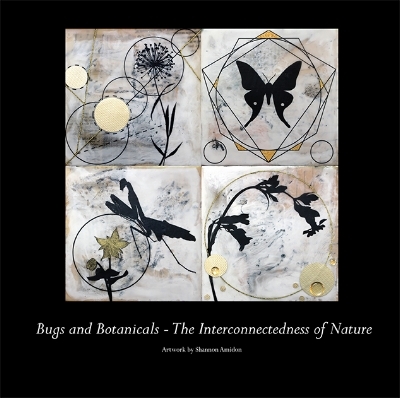 The 8.5 x 8.5 full color, art book contains beautiful and intriguing imagery exploring her theme of Bugs and Botanicals – The Interconnectedness of Nature. with a variety of insects and botanicals. Each piece was created with the ancient medium of encaustic (molten beeswax) and incorporates a variety of vintage paper ephemera, 23k gold leaf, thread, glass beads and more layered beneath the wax. You can also purchase a beautiful physical copy on Amazon!